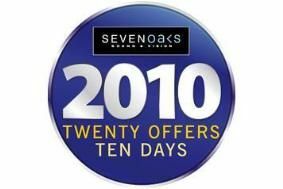 EXCLUSIVE OFFER: Sevenoaks 2010 discounts for whathifi.com users | What Hi-Fi? The 2010 sale – 20 offers running over 10 days – continues until January 23rd, 2010. These offers are only available at the participating stores, listed below, and while stocks last. You'll need to call in at the nearest store in person (it's worth calling and reserving on the phone before you do), and quote 'whathifi.com 2010 offer'. These offers are not available to buy online or by mail order.